Imagine a day that starts with a hot cup of coffee and homemade donuts made right before your eyes and continues with good food, icy cold drinks, fun, excitement without ever having to lift a finger! If you like to reserve a date for catering Click Here >> Tomahawk Lake's Country Picnic is perfect for an outing for your company, social group or family! The old fashioned picnic place with hundred of picnic tables in a shaded grove, viewing a crystal clear lake on a fabulous white sand beach. LATE MORNING - Tomahawk Lake's Famous Manhattan Clam Chowder and Chicken & Rice Soup. LUNCH - Charbroiled Hot Dogs and Hamburgers, Veggie Burgers, Macaroni Salad, Potato Salad, Cole Slaw, Baked Beans and all trimmings & condiments. *$8 will be added to each member of the group for unlimited use of mountain of water slides. Enjoy a day filled with great food, beautiful scenery, dancing, bingo and more at Tomahawk Lake. Tomahawk Lake offers many activities for active seniors and provides a comfortable, entertaining setting for those seniors who simply like to enjoy each other's company. NOON - Tomahawk Lake's Famous Manhattan Clam Chowder and Chicken & Rice Soup. BUFFET LUNCHEON - Charbroiled Chicken, Pasta, Corn-on-the-Cob, Macaroni Salad, Potato Salad, Cole Slaw, Baked Beans, Biscuits & Butter, and Make your own Sundae for dessert. *Price Includes admission, sales tax & gratuity. $10.00 Extra for each additional person over limit. Tomahawk Lake offers special picnic sites to groups who prefer to do their own cooking*, rather than have a catered event. A non-catered picnic is perfect for corporate picnics, family reunions, social groups, birthday parties and office functions. 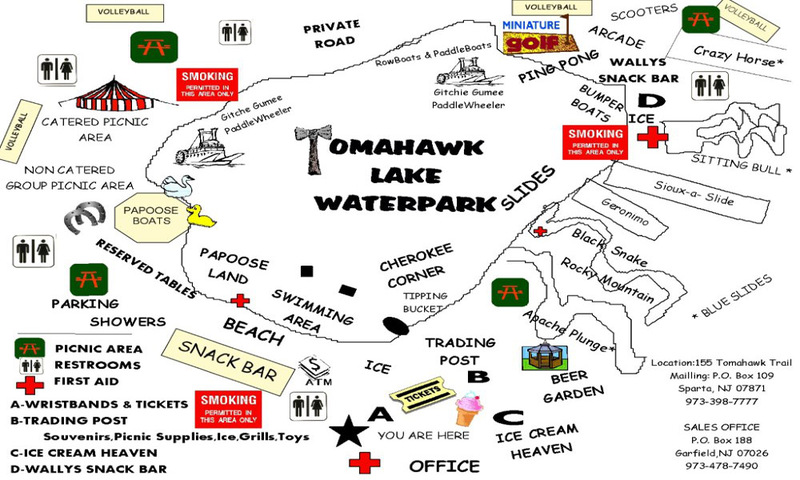 For a nominal reservation and clean-up fee, Tomahawk Lake provides a beautiful picnic grove, personalized sign, large charcoal grill, parking near your picnic site and the ability to purchase kegs of beer and birch beer for your picnic. Reservations for a non-catered event must be made through the Group Sales Office in advance. At the time of reservation, arrangements can be made for the purchase of kegs of beer and birch beer, ice, charcoal, as well as, admission and rides.